It is a fundamental human right that Indigenous peoples be guaranteed an education, which respects and strengthens our cultural heritage. A right and not a privilege. Gross and systematic violation of the rights of peoples belonging to particular groups has been, and continues to be a perennial component of social relations throughout the world. Even given the efforts of the United Nations in the last 50 years to promote universal respect for human rights, it remained clear to members of oppressed groups, and anyone else who cared to see, that control over wealth, political power and knowledge has remained in the hands of the same dominant groups, albeit under the proviso that they ought to try not to discriminate too much. 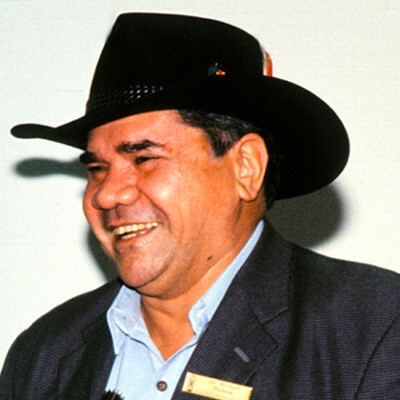 Michael James "Mick" Dodson AM, FASSA (born 10 April 1950, in Katherine, Northern Territory) is an Indigenous Australian barrister, academic, and member of the Yawuru peoples in the Broome area of the southern Kimberley region of Western Australia. His brother is Patrick Dodson, also a noted Aboriginal leader. Following his parents' death, he boarded at Monivae College, Hamilton, Victoria. He graduated with degrees in Jurisprudence and Law from Monash University in 1974, as the first Indigenous person to graduate from law in Australia. Following graduation, he worked as a criminal solicitor for the Victorian Aboriginal Legal Aid Service, and later as a criminal defence barrister at the Victorian Bar, where he still practices as a barrister specialising in native title. He has worked extensively as a legal adviser in native title and human rights, and as an academic in Indigenous law. He is currently Professor of Law at the Australian National University, as the director of its National Centre for Indigenous Studies, and has lectured as a visiting academic at the University of Arizona and Harvard University respectively. He has been a prominent advocate of land rights and other issues affecting Indigenous peoples in Australia and globally and has extensive involvement in the United Nations Forum on Indigenous Issues. He is the Chief Investigator for the 'Serving Our Country: a history of Aboriginal and Torres Strait Islander people in the defence of Australia' project which is an Australian Research Council-funded research project based at The Australian National University. On 25 January 2009, he was named Australian of the Year. He now lives and works in Canberra.